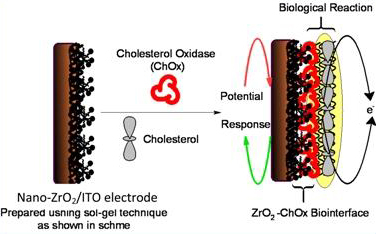 The sol-gel derived nanostructured zirconium oxide (nano-ZrO2) film has been fabricated onto indium-tin-oxide (ITO) coated glass to immobilize cholesterol oxidase (ChOx) to detect cholesterol. The oriented structural growth of nanoZrO2 (with respect to 100 planes) has been confirmed using low angle X-ray diffraction (XRD) studies. The results of optical and electrochemical studies suggest that three dimensional cationic nanoZrO2 platform provides an effective surface to ChOx resulting in enhanced electron transport to the bioelectrode. The low value of Michael-Mention (Km) constant suggests the good affinity of cholesterol to ChOx immobilized onto nanoZrO2/ITO electrode.